Joyce completed her undergraduate studies at Skidmore College in Saratoga Springs, NY where her major was fine art and her minor area of study was art history. She continued her studies and received a Masters of Fine Art degree from Syracuse University. After being a successful graphic designer and illustrator for many years, she switched careers to her first passion and is painting full time. Oil painting is Joyce’s medium of choice for its richness, depth and variety of colors it can produce. Living close to the turf and the sea, Joyce has been focusing on painting the worlds of thoroughbred racehorses and sailing — “the two most beautiful sports.” “In these sports there is so much beauty, so much emotion — so much to capture on canvas! It is great to watch or participate in the excitement of a sailboat race or the heart stopping thrill of thoroughbreds racing to the wire. There is a love of horses that parallels a love of boats, and you can see it in the care, up-keep, and time and money people invest in both. 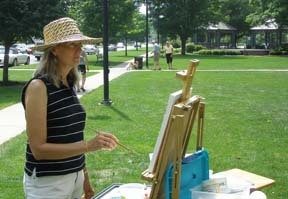 In thoroughbreds, man has harnessed the power of one of God’s greatest creatures, and in sailboats, man has created vessels to harness nature’s power of the wind.” From dawn to dusk, you may spot Joyce at various locations in her search for subjects to paint . She has been in numerous juried exhibitions and has won awards in Rhode Island, New Jersey and Pennsylvania. Joyce has taught at Syracuse University, Syracuse, NY, and Stockton College, Pomona, NJ. For several years, she enjoyed teaching art classes for adults and children at Jane Law’s Long Beach Island Studio and Gallery in Surf City, NJ, and later at the Wickford Art Association in Wickford, RI. In 2003, Joyce moved to Rhode Island when she married Rev. Wesley Smith, an American Baptist minister. Her artistic talents were used in creating the church’s website and designing promotional materials for the church and and other non-profit community organization. Joyce, Wes and their golden retriever Skimmer now live in Harvey Cedars, NJ. Joyce is back to painting the wonderful beauty of Barnegat Bay and the Atlantic Ocean.